How Much Exercise Do My Dogs Need? How often should I exercise my dog and for how long? This multi-part question is one that dog owners often ask. The exercise needs of dogs vary. Consider several factors as each relates to your dog specifically - breed, size, age, and current health - to determine exercise needs. You might also need to consider current weather conditions. Certain breeds need more activity each day than others. For example, dogs with ancestors in the hunting, herding and working groups typically require more daily activity than say a Shar Pei, or a Boston Terrier, and other breeds with short snouts. Hunting and herding dogs in good health need at least 30 minutes of rigorous exercise daily along with two hours or more of an engaging activity. Intense exercise sessions of 60 minutes twice daily are ideal, if at all possible. Breeds such as Basset Hounds and Mastiffs require only small amounts of exercise to remain happy and healthy. If you're like me and all your dogs are adorable mutts with pedigrees that are difficult to figure out, using the breed factor to determine exercise needs is out. When it comes to a client's pets, I follow the client's instructions. That's simple enough. However, when it comes to my own dogs I use others factors to help me determine how much exercise each needs and it varies based on the individual dog. For the majority, once a dog matures beyond the puppy stage, bigger dogs need more exercise than small dogs. However, this is not true for all larger dogs. A lot of it does depend on the animal's ancestry whether "pure-bred" or not. For example, Mastiffs and Greyhounds do not require as much exercise as say an adult Labrador retriever. Once again it all depends on the individual animal. Puppies need LOTS of exercise along with sufficient mental stimulation to develop properly. If your puppy is anything like my Dylan, he has two speeds - sound asleep and wide open. On each day that I can, I allow him to tell me when he's had enough. He loves to chase toy balls, pop bubbles, splash in his pool, go for walks, wrestle with his best friend, Dawg the Cat, dig huge holes in the backyard and chew on anything within reach. (And yes he is disciplined.) He's also a pup and is allowed to do most anything that will not hurt him or another animal. You would know that that narrows the list of activities he's allowed to do considerably, if you know Dylan. Back to exercise, Dylan will chase and return a ball diligently for 30-45 minutes or more. Fetch, however, is only one of many "favorite" activities he enjoys. When it's extremely hot outside, I do on occasion have to make him take a water break and rest. My big dogs rarely enjoy play-exercise any more. They do enjoying walking on a leash, however, and smelling a new environment. Your pet's current health is another major factor in how much exercise he or she needs. In addition to short-nose dogs, any pet with respiratory problems, heart ailments, diabetes, and other serious conditions need to be evaluated by your vet to know how much exercise is good and how much is too much. Dogs suffering from arthritis and other painful conditions oftentimes simply cannot exercise as much as needed. 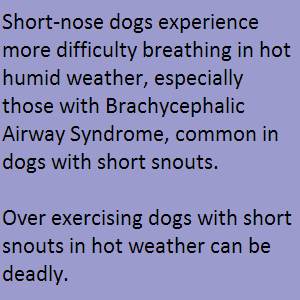 The current weather conditions must be considered each day before allowing dogs to exercise outdoors. I live in Kentucky, where summer temperatures often reach the mid-90s. Add high humidity levels and it feels like the subtropics. In the winter, with temperatures below freezing and a good dose of wind chill, close your eyes and imagine the North Pole. Seriously, it's not that extreme in the winter but the weather must be considered when exercising your dog to prevent problems. For example, all my dogs wear the fur coat they were born with, which means I have no idea how hot or cold each feels in Kentucky's climate. So, I try to make an informed guess. In other words, I don't walk my dogs when the heat and humidity are so high that it hits me in the face like a physical presence when I step outside or when the wind chill falls down into dangerous frostbite temperatures. When we're experiencing drastic weather extremes, I allow my dogs out in the fenced-in yard to go potty and then wrestling with each other several times a day indoors is about the extent of the exercise. I decide for the Pup and whether he plays indoors or out, he needs several hours of physical exercise and mental stimulation daily. Obviously, your vet can help you determine if your dog is getting enough exercise. Several tell-tale signs can help in reaching a conclusion. Dr. Ward says obesity causes immeasurable pain and suffering, killing our pets prematurely and costing tens of millions of dollars in medical bills, all of which is preventable by responsible pet owners. I must admit I'm guilty of feeding my pup Dylan too much "people food." Right now at this point in his life, he burns a zillion calories daily but I know that will change as he ages and slows down. That will require some discipline on my part not to be persuaded by those brown begging eyes. Boredom is a major cause of destructive behavior and boredom may be a sign of insufficient exercise. For example, if you come home and your dog has eaten the couch, she might not be getting enough exercise. Exercise not only helps physical health, it also provides much needed mental stimulation for your dog, greatly reducing the possibility of your pet getting bored. It's important not to overlook mental stimulation when exercising your dog. While it can be tempting to play fetch in the garden instead of a walk, there are no new smells or opportunities for your dog to socialize. This can lead to boredom, destructive behaviors and other negative symptoms. Your dog may appear sad or depressed, resulting from a lack of mental stimulation. Fortunately, it's easy to add some mental stimulation to your dog's exercise. 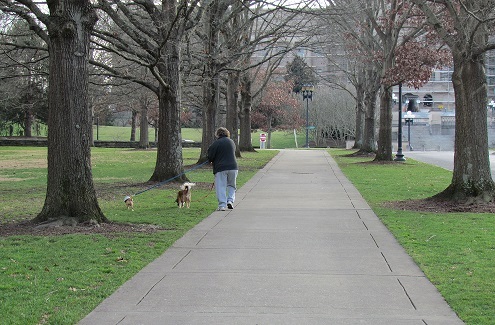 Walking through woodland or a dog park provides plenty of opportunity to sniff new smells and meet other dogs. Adding extra mental challenge to games such as fetch, perhaps by asking your dog to wait when you throw the ball and then getting him to find it, can be useful. The Dog Clinic offers a list of indoor games you can use to mentally tire your pet. These games are great if the weather is too hot or cold for a long walk, but you still want to make sure your pet doesn't get bored throughout the day. If you have any tips on how to exercise your dog indoors anytime or outdoors in inclement weather, would you consider sharing them with my readers? You can email your tips to us and we'll pass them along to other dog owners.